Our Alternating Man Made Sapphire Princess Cut and Cubic Zirconia Round Channel Set Eternity Band features alternating princess cut and round brilliant cut stones combined together in a channel set eternity band. 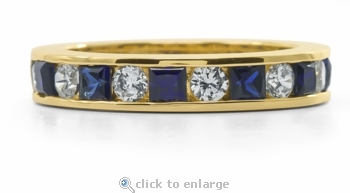 Man made sapphire blue princess cut stones and lab created laboratory grown simulated diamond look cubic zirconia round stones that add to the brilliance of this unique band. The band measures approximately 4.25mm in width. 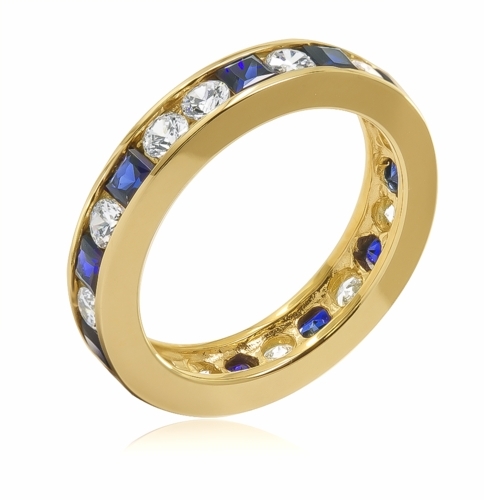 It is available in 14k yellow gold and this eternity band is offered in a ring size 8.5. For further assistance please call us directly at 1-866-942-6663 or visit us via live chat and speak with a knowledgeable representative.